Thanks so much to the Salem Area Chamber of Commerce for the opportunity to present to them on June 29, 2018. I gave them a little preview of my upcoming talk at the DoYoLive Marketing Conference in Youngstown, Ohio on August 3, 2018. The topic was the "Purpose Driven Business," and this will be a talk I will be giving with Fortunato Figliano from the Centers for Hearing Care. What I have included above are the slides (via slideshare) and also the video (via youtube). Question: What are some safety tips when using fireworks? Welcome to Summer! With the official start of summer happening, it's always great talking about sun and fun. However, it's also an important time to talk about summer safety tips. June is Fireworks Safety Month. According to the National Safety Council, in 2016, at least four people died and about 11,000 were injured badly enough to require medical treatment after firework related incidents, according to the Consumer Product Safety Commission. Another interesting fact is that on a typical Fourth of July, fireworks account for two out of five of all reported fires, according to the National Fire Protection Association (NFPA). Also check out the video below from the NFPA. Check out some helpful tips above. Better yet, grab a blanket and a patch of lawn, kick back and let the experts handle the show. Question: What are some facts about Hearing Loss? Question: What can you do to prevent Hearing Loss? With Mother's Day coming up, when was the last time you checked in on mom's hearing? Did you know that at least 20 percent of US adults, at some point of their life, has a significant problem with hearing, balance, speech or language. Communication disorders can compromise physical and emotional health and affect many aspects of life. 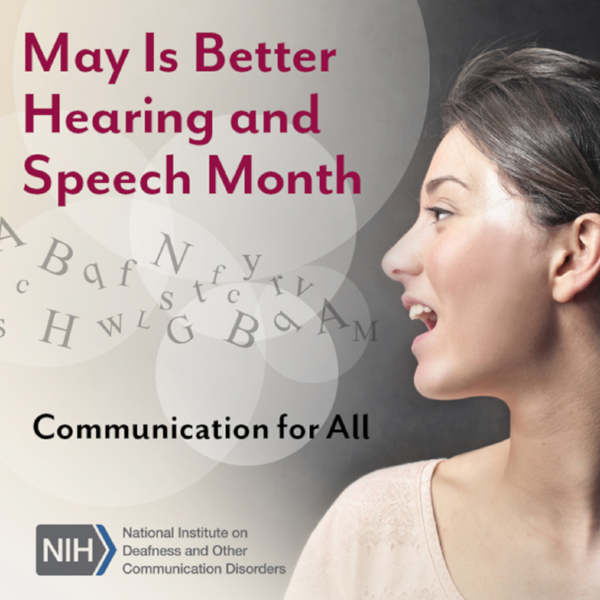 The National Institutes of Health (NIH) observes the month of May as National Better Hearing and Speech Month. In the USA, one is six adults reports having some trouble hearing, which equals approximately 46 million adults. And, this number has doubled in the past 30 years, as younger people experience hearing loss due to prolonged noise exposure. In addition, about 28.8 million adults have hearing loss severe enough that they could benefit from hearing aids. I see a lot of children and adolescents in my office as well, and I get a lot of questions from parents about hearing health. Here are some interesting facts about hearing and young people from the NIH Listen Up awareness campaign. Five in ten young people listen to their music or audio too loudly. Four in ten young people are around dangerously loud noises during events like concerts like concerts and sports events. What can you do to prevent Hearing Loss? First of all, don't wait until it's too late. Start protecting your hearing now, because once you have hearing loss, you cannot get it back. Especially for young people, lower the volume in your earbuds and headphones. Also, move away from the noice, especially at concerts and sporting events. In addition, wear hearing protection like earplugs or earmuffs. For adults, I recommend visiting your local audiologist, like our friends at the Centers For Hearing Care, to have a formal consultation and hearing test. Finally, if you need hearing aids, I'd consider at least trying them out to see if you would benefit. And, also interesting is that some chronic medical problems, and some medications can affect hearing as well. So, a good time to check in with your Family Physician as well to explore possible medical problems associated with hearing. National Infant Immunization Week (NIIW) is a national observance to highlight the importance of protecting infants from vaccine-preventable diseases and celebrate the achievements of immunization programs and their partners in promoting healthy communities. For 2018, NIIW is April 21-28, 2018, and this year it is celebrated as part of World Immunization Week, an initiative of the World Health Organization. Since 1994, local and state health departments, national immunization partners, healthcare professionals, community leaders from across the United States, and the Centers for Disease Control and Prevention, have worked together to highlight the positive impact of vaccination on the lives of infants and children. Vaccines are among the most successful and cost-effective public health tools available for preventing disease and death. Just as an example, among children born between 1994-2016, vaccination will prevent an estimated 381 million illnesses, 24.5 million hospitalizations, and 855,000 deaths over the course of their lifetimes. Giving babies the recommended immunizations by age two is the best way to protect them from 14 serious childhood diseases, like whooping cough and measles. Parents are encouraged to talk to their doctor's health care provider to ensure that their child is up-to-date on immunizations. Protecting babies from whooping cough begins before a baby is even born. All pregnant women are recommended to receive the whooping cough vaccine or Tdap during Each Pregnancy. This will help protect babies from whooping cough until they can receive their first whooping cough vaccine at 2 months. Myth 2: Vaccines can contain preservatives that are dangerous: I get a lot of questions about thimerosal which is a compound that prevents the vaccine from being contaminated by bacteria. It's true that there were concerns about this in 1999, and thimerosal was removed from nearly all vaccines back at that time. Now, there are thimerosal-free vaccines, and follow-up research has shown that there is no connection between a vaccine containing thimerosal and medical problems. Myth 3: Now that major illnesses have largely disappeared, we really don't need vaccines anymore: I wouldn't bet on this. Remember the 2014 Mumps outbreak at Ohio State University? Remember the 2015 Measles outbreak in an Ohio Amish community or the 2015 Measles outbreak at Disneyland in California? And, there are more examples out there which show why adequate and appropriate immunization is required. If you have questions or concerns about vaccines or immunizations, I encourage you to talk with your physician or health care provider. I also encourage you to check out this link from the CDC about "Recommended Vaccines By Age," and this link from the Ohio Department of Health about "Immunization Information For School." Thanks to WKBN for including by thoughts in this article "Doctors Stress Importance Of Vaccinations in Children." I also encourage you to check out the WKBN Facebook page where there are still negative comments about vaccines. Still a lot of education needs to be done. Do you know what "Pharming Parties" are? This is a dangerous trend where teens come together and bring medicines from their parents and grandparents medicine cabinets, and they take these medications for fun. You can read more about it from WKBN-TV in the article, "Columbiana County survey shows more kids using prescription drugs"
2 in 3 Teens who report Abuse of Prescription Pain killers are getting from Friends, Family, and Acquaintances. What can the community to do to turn back this trend? First of all, all of us have to learn more about the problem, especially with kids and adolescents. I encourage people to visit the website of the Partnership for Drug-Free Kids at this link, which has great resources. On that website, they outline three steps to help combat the problem: talk with your kids, take action to address medicine abuse (like locking up your prescription medication and participating in National Prescription Drug Take Back Day), and get help for a loved one. 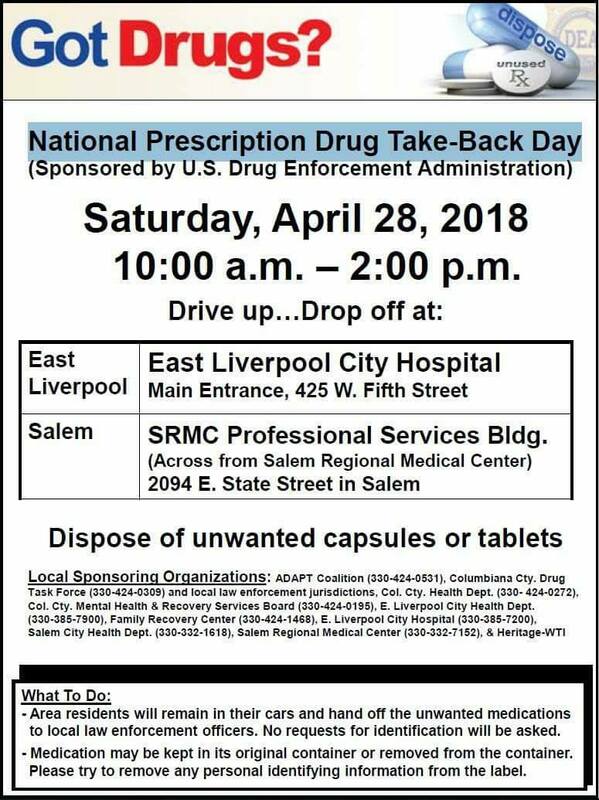 National Prescription Drug Take Back Day aims to provide a safe, convenient, and responsible means of the disposing of prescription drugs, while also educating the general public about the potential for abuse of medications. It is coming up on April 28, 2018 from 10AM to 2PM. Check out their website at this link for more information, including finding a collection site close to you. "Prescription To Prevent Falls" is an initiative promoted by the Ohio Department of Aging for April 1-7, 2018. The initiative encourages Ohioans to visit their Family Physician or pharmacist to review their medication list, especially for potential interactions and side effects. Especially with older people, medication interactions and side effects, and cause detrimental complications, like falls. In addition to prescription medications, it's important to review all over-the-counter medications, especially vitamins and herbal medications. I encourage to to check out The Ohio Department of Aging website along with the "Steady U Ohio" webpage as well. Thanks to WKBN-TV for including my soundbite in their story. Even though it's early April 2018, the Centers for Disease Control is still reporting concerns with Influenza still being around, even at this late date. What can be the difference between Influenza symptoms and allergy symptoms, thanks to WKBN-TV for including my soundbite in this story. Do you know what "Juuling" is? Well, your kid does, and he or she has probably tried it, and you don't even know it. Of course, kids don't say they smoke these days, because it's not cool. The term "vaping" has bubbled up in the past couple of years, but kids have now moved on from that. The term now is "juuling," and the scary part is that smoking, vaping, and juuling - they all mean the same thing - the intake of nicotine. Juuling is another name for e-cigarettes, and kids and adults are noticing them because they are the fastest growing e-cigarette in the US market. Why are they so popular? The first reason is that they are so small and easy to hide - from, say, school officials. They look like a computer flash drive, and, in fact, they can charge in a computer USB port. Secondly, they're popular because they're flavored with names like creme brûlée, cool cucumber, and mango. And, the most important reason they're popular is because of the perception that they're safe. Kids say, "I mean, I'm not even smoking or vaping. I'm juuling." We're now starting to see research studies that are confirming our health fears. In March 2018, there was a study in the journal "Pediatrics" which showed that teenagers using e-cigarettes are exposing themselves to chemicals which may cause cancer. The Surgeon General of the United States has already outlined the other potential health dangers like Brain Risks and Addiction. What is a parent to do today? I advise three things. First, learn more about e-cigarettes, vaping, and juuling by checking out the facts at the Surgeon General website. Secondly, I'd have a dialogue with your child and start by asking them what they know about juuling. And, finally, emphasize to your child that juuling still means using nicotine, and the health and addiction dangers that go with it. Flu Shot = Heart Attack Prevention? If you need another reason to get your flu shot, how about this one: The Flu Shot may prevent a heart attack. Research from Public Health Ontario was announced this week, which makes this exact claim. In addition to the original research, I encourage you to check out the following article from CNN: "Bad Heart? Don't Forget Your Flu Shot." Also check out the following article from WKBN-TV: "Not just the flu anymore - study claims flu shots also prevent heart attacks." We don't really know why this happens. We don't know the exact mechanism. But, it does make sense that infections like influenza cause inflammation, potentially increase the chance for blood clots, and increase the stress of the heart when one has an infection like influenza. The study also claims that getting the flu shot may be as important as quitting smoking and taking your blood pressure medications. I think that's a little bit of a leap of faith, but I'll have to check out the data more carefully. As I said in the video (and in real life), it's never too late to get your flu shot. I think that the flu season may extend into March, and even April. So, whether you have heart disease or not, talk to your personal physician about getting a flu shot. March is National Colon Cancer Awareness Month. If you want to learn some alarming statistics about colon cancer, I direct you to The American Cancer Society website. In 2018, there will be an estimated 97,220 new cases of colon cancer. Colorectal cancer is the third leading cause of cancer-related deaths in men and women in the United States. It's expected to cause about 50,630 deaths during 2018. Unfortunately, many of my patients only focus on the family and genetic factors related to colon cancer, especially those who have no family history of colon cancer. The American Cancer Society website does a great job of outline those family and genetic history factors. However, there are other factors to keep in mind, including lifestyle factors like being overweight or obese, physical inactivity, certain types of diets (like those high in red meats and processed meats), a history of smoking, and heavy alcohol use. All of these factors may increase your chance of colon cancer. Many patients tell me, "Doc, I'm never getting a colonoscopy." These days, there are many ways to screen for colon cancer, more than and in addition to colonoscopy. Cancer screening of all types and wellness issues are great topics to talk about with your personal physician. Talk about your risk factors with your physician, and talk about what type of cancer screening is best for you. Unfortunately, I'm seeing more and more instances of colon cancer that could have been prevented. Make that appointment with your physician. Don't become a statistic.